It was 1985. I had only been studying Iyengar Yoga for a few years. Still like a kid in a candy store for new age ideas, whenever the Whole Life Expo came to Austin I was always there. At one of the booths I found an Acro-Massage video and bought it. A very beautiful couple produced the video to promote a therapeutic acro massage yoga technique that involved putting someone in a folded leaf pose, doing massage, and twisting the person. As certain as I was that it would be a whole lot of fun to do that, it was very difficult to find anybody who was willing to try it with me, let alone practice. Whenever I showed the video to my friends most of them said it looked too hard and they didn't want to do it. Some even said it looked dangerous. The few people who agreed to try it concluded that it was very difficult. After falling on my head a few times, I couldn't disagree. We simply didn't have the patience to master it. My acro practice never got off the ground. Twenty five years later a friend of mine invited me to an acro-yoga class, so I went to see what it was all about. It was a beginner to intermediate series and I thought I would be able to handle it because of my Iyengar Yoga background. Unfortunately I showed up on a night when the intermediate techniques were being studied and couldn't accomplish a thing. I left the class feeling defeated and hopeless thinking acro-yoga isn't for me. Five years later I showed up early for Robert Gardner's Thai Massage Jam when it was at Blue Honey Yoga, and Noah Shipley was teaching an acro yoga class. Watching him teach made me want to try it again, so I took a couple of his classes. I still wasn't very good at it. But I was able to accomplish a few fun things. The deep stretching exercise I got made my body feel wonderful, so I decided to go to an Acro Yoga Jam. Fortunately two very accomplished acro yogis asked me if I would like to fly that night and forever changed my life. Before I even knew what was happening I found myself upside down in the air doing things that I didn't know were humanly possible, much less that I could do them. Acro-yoga is much easier if one person knows how to do it. I had the good fortune of flying with two very experienced bases in one night at my first acro-yoga jam! May God profoundly bless the tenacity and dedication it must have taken for the pioneers of Acro-Yoga to figure out how to do the forms and integrate them into a flow. Knowing I could accomplish something that I had no idea was humanly possible was exhilarating, to say the least. Hoping and praying that my newfound awareness of my own potential could spill over into other areas of life, I was immediately hooked on the high of a good fly. Never shall I deny that I am a certified full-fledged controversial Acroholic. Discovering Acro-Yoga so late in life was an emotional experience for me. I immediately longed to be much younger again and felt sad that I didn't know about what was going on at the beginning and get involved earlier. At sixty years old I was afraid of being dropped by a beginner and breaking a bone. But I knew that I would rather fly and fall than to have never flown at all, and I was devoted to learning as much as I could. Despite having an ambivalent personality type, this is the most wholehearted thing I have ever done. I signed up for a couple of beginner classes taught by Grant Shipman of Yogabatics and then moved up to his intermediate series. I also took as many private lessons as I could afford and practiced a variety of techniques with four different accomplished Acro-Yogis. 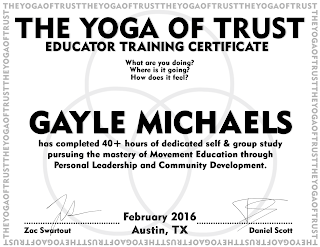 Ultimately I signed up for a teacher training course offered by Daniel Scott and became certified to teach. The advantages of taking private lessons from someone who knows what they are doing are many. Aside from the opportunity to learn techniques and flow quickly and efficiently, you also have a personal trainer who is dedicated to seeing to it that you build strength and get in shape. Optimal fitness is important in a contact sport where connection is the key. If you have ever tried and failed over and over in a beginner class, the appreciation you feel for an accomplished instructor who knows how to make it possible for you to do the things that you've never been able to do before is profound. I happen to have a body that needs very heavy exercise. Without it I feel sickly and depressed. With it I feel strong, healthy, hopeful, and happy to be alive. I am also a person who will not get the exercise I need unless it is fun. Acro Yoga is the most fun exercise I have ever found. It is an honor and my pleasure to share this experience with others.